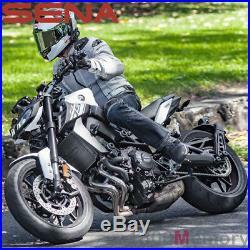 Sena Motorcycle Helmet Bluetooh Mesh Intercom. MESH INTERCOM, A STEP ABOVE - Self-optimizing and intuitive tech so you can focus on the ride Sena Mesh Intercom technology is now here and ready to change your ride. Simply press the button on top of the 30K to turn on public mode, and you will be automatically and instantaneously connected to a virtually limitless amount of 30K users within a mile range. Intercom connections are also now more stable than ever with Senas new Mesh Intercom technology. When one of a groups riders goes out of range, the rest of the group remains seamlessly connected while the 30K still intelligently searches for the lost connection and reconnects automatically once back in range. No longer will you have to worry about losing half of your group due to a Bluetooth chain linked connection of the past. With private mode you can invite and communicate with up to 16 riders at a range of up to 2.0 km (1.2 miles), while an endless amount of Guests can join to listen in as well. When riding with 5 or more riders, the Mesh Intercom will intelligently keep the group connected at a range of up to 8 km in ideal riding environments (5 miles). NOW MORE CONNECTED THAN EVER - Dont leave your buddies in the dust The technological advance of Senas Mesh Intercom technology has the ability to work in conjunction with Bluetooth allowing for more connections than ever before with the 30K. The 30K packs all of the capability necessary to ride in large groups. Designed with an innovative dual antenna and 2 separate processors, one for Bluetooth, and one for Mesh Intercom technology, the 30K has the ability to connect to each processor simultaneously with the new multi-operation feature. With the ability to dually connect to both Mesh Intercom and Bluetooth 4.1 simultaneously, the 30K offers the connectivity you need while riding. TOP OF THE LINE TECH KEEPS YOU AHEAD OF THE CURVE - More features to keep you riding in the right direction The 30K has a new quick charge feature meaning just 20 minutes of charging gets riders an impressive 5 hours of Bluetooth intercom use, or 3 hours Mesh Intercom use. With its revolutionary dual-antenna, riders may now simultaneously use all of the features of the 30K, such as Mesh Intercom and Bluetooth intercom. Once youre on the road, complete control of the 30K can be done through hands-free voice commands. The water resistant 30K is compatible with Senas optional Handlebar Remote control as well as all of the 20S clamp accessories. No longer do users have to deal with the frustrations of interruption-based audio functions of past Bluetooth communication devices. Now audio features wont interrupt one another but simply overlay for a smooth listening experience. Amp up your ride with interweaving audio sources. The 30K can also easily connect to the Sena RideConnected App to intercom with a virtually limitless amount of riders over an infinite range, so long as you are connected to a mobile network. 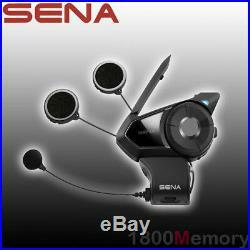 The remote control is supported with the Sena 30K to provide ease of use and controllability of the Bluetooth headset. The handlebar remote has a clamping design for quick and easy installation. With a low energy Bluetooth profile, it has an extensive battery life of three to six months and can be easily charged with a USB. 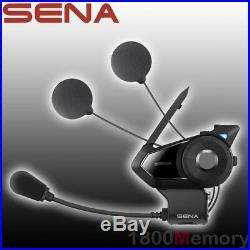 The remote is also compatible with the Sena 10C and 10U. Multi-way intercom up to 8 connections. Smartphone App for iPhone and Android. Industry First: Mesh Bluetooth Module Communication System. Intuitive voice prompts and commands. Built-in FM radio tuner with a station scan and save function. Universal Intercom: intercom with other brand communication systems. Water resistant for use in inclement weather. Talk Time: Up to 13 hours. Main module: 102 mm x 56 mm x 27 mm (4.0 in x 2.2 in x 1.1 in). Speaker: driver unit 40 mm thickness 6.5 mm. Boom microphone length: 190 mm. Weight (module): 61 g (2.15 oz). Bluetooth 4.1 Profiles: Headset Profile (HSP), Hand-Free Profile (HFP), Advanced Audio Distribution Profile (A2DP), Audio Video Remote Control Profile (AVRCP). Bluetooth Intercom: Working distance up to 2.0 km (1.2 miles) in open terrain. Mesh Intercom: Working distance up to 2.0 km (1.2 miles) in open terrain. Built-in FM radio with RDS AF (Radio Data System Alternate Frequencies). Radio frequency specifications: 64 108MHz. 10 preset station memory with automatic scan function. Battery charging time: 1.5 hours, Lithium polymer. 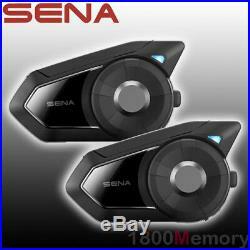 Each SENA 30K package includes the following items (Dual pack contains 2 sets of everything). 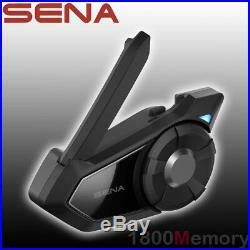 The item "Sena 30K Dual Helmet Motorcycle Bluetooth 2km Mesh Intercom Headset System" is in sale since Monday, December 3, 2012. 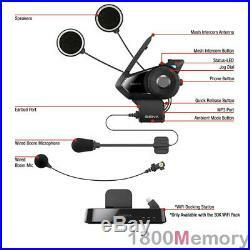 This item is in the category "Vehicle Parts & Accessories\Motorcycle Parts\Electronics & Navigation\Intercoms". The seller is "1800memory" and is located in New South Wales. This item can be shipped worldwide.